Relative Age - the age of rock layers in relation to other rock layers. You don't know the rocks exact age, just which one is older or younger. Actual Age - the actual age of rocks in years. It's easy. When you look at the layers of sedimentary rocks, the older layers are on the bottom, below the younger layers. If you think back to how a sedimentary rock forms, it makes sense. The relative age of igneous rocks, due to an intrusion, are younger than the rock layers they cut across. That means that a sedimentary rock is always OLDER than the intrusive rock that rudely shoved its way into it. All sedimentary rocks should be in flat layers. If not something seriously went wrong. The most likely culprit is a mountain building event that created folds, tilts and even faults. Remember that all faults are younger than the rock they cut across, because the rocks must be there first for the fault to occur. Unconformities are erosional events that break the sequence of deposition. On a cross section, it looks like a thick wavy black line interrupting the parallel layers of sedimentary beds. An outcrop is where the rock layers are exposed, such as on a cliff or road cut. Most rock layers are covered in soil and plants so identifying the relative age of rocks can be a detective game. By matching the characteristics of several outcrops, we can determine the relative position of identical rock layers and then figure out which is older. Using physical characteristics Wegener, the scientist that proposed continental drift, noticed similar rock layers in Africa and South America. One rock layer had white diamonds in both South Africa and Brazil! Wegener theorized that these areas must have been connected at one point in time, and this led to his famous theory we now know as plate tectonics. Index fossils are remains of organisms that are common, lived in a wide geographic area and existed for only a short period of time. In other words, if you are trying to identify the relative age of a rock, finding a fossil that only lived in a small region or that lived for a really long period of time is useless. Check out these index fossils greatest hits. Key beds are beds that have a very unique property that is not easily confused with other rock layers. Examples include volcanic ash deposits, coal seams or nuclear fall-out! Another interesting key bed item would be Iridium, a radioactive material often found in meteors, but rare on earth. This layer is 66 million years old. Scientists theorize that a huge meteor collided with the earth, and then sent a huge cloud of dust rich in Iridium circling the earth, which then settled and became part of the rock layers. It is the "smoking gun" for the massive dinosaur extinction. Just as a clock is broken into units of time, so is the geologic record. Instead of being broken into minutes, hours, and seconds, geologic time is broken into different units- eons, eras, periods and epochs. 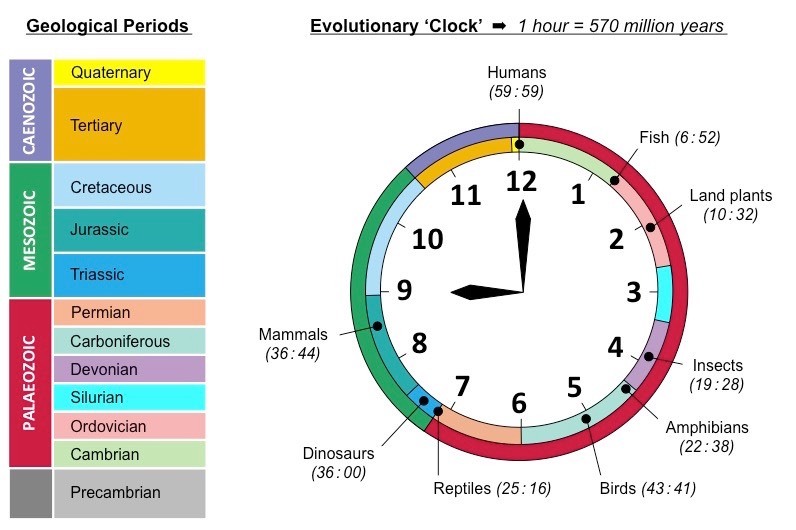 Eons are the largest geologic unit of time. The oldest is the Archaen, or the time from the creation of the earth to the appearance of bacteria-like multicelled organisms. The next eon, called the Proterozoic, was the period in which multicelled organisms ruled the world. We don't know much about these critters however because they had no hard preservable parts. Combined, the Archaen and the Proterozoic are called the Pre-Cambrian. The next eon is called the Phanerozoic, which we are now in. Obviously, multicelled organisms with preservable parts are everywhere. As time went on life forms became more and more complex. Eons are divided into eras, based on fossil records. Due to the fact that the Precambrian has no fossils, the Archaen and Proterazoic eons have not been divided. Eras are divided into periods, determined by rock formations and their ages. Periods are divided into epochs, the smallest geologic unit of time. Each period usually has three epochs, early, middle, late. The exception is the Cenozoic Era (our era) which is divided into all sorts of different Greek names (ex. Anthropocene- our present epoch). Half Life Chart. What is going on here? All elements are made from atoms, and most elements have different isotopes. Isotopes are varieties of an element with a different mass because they contain a an unusual number of neutrons. An example is carbon. Its isotopes include C-12 and C-14. The number following the chemical symbol of the element is called the atomic mass. Most isotopes are stable, meaning they will not change. Some isotopes, however, are very unstable. During the process of radioactive decay, atoms split apart, releasing energy and parts of their nucleus. The atom will release material and energy until it becomes a stable isotope, and this atom is no longer radioactive. This is called the decay product. An example is Uranium-238 (U-238), which will decay into Lead-109 (Pb-109). Radioactive decay will occur at a constant rate for each particular element. It is not affected by any factors- not pressure, not heat, nor even the neighborhood it exists in. When rocks contain minerals with radioactive isotopes, their radioactivity can be used as a clock. The half life of a substance is the amount of time that one half of the unstable radio-isotope takes to turn into a stable decay product. For example: The radioactive half life for Uranium-238 is 4,500,000,000 years or 4.5 billion years. If you originally had ten grams of U-238, in 4,500,000,000 years five grams of U-238 would turn into lead called Pb-109 and five grams of U-238 will remain the same. But in the next half-live (in another 4.5 billion years), half of the remaining U-238 would turn into Pb-109 and half will stay the same. Now you have a grand total of seven and 1/2 grams of Pb-109 and two 1/2 grams of U-238. It's like magic.